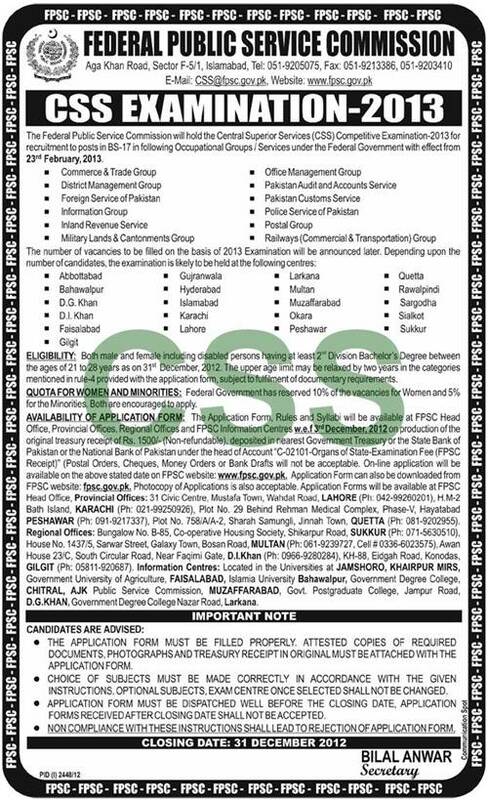 Federal Public Service Commission of Pakistan announced the CSS competitive examination for recruitment to posts in BS-17 in year 2013. CSS examination will be held for recruitment in 12 different occupational groups/ services under the Federal Government of Pakistan w.e.f. February 23, 2013. Examination will be held in almost 21 centres across Pakistan. Number of vacancies and final list of examination centres will be announced later. Age between 21 ~ 28 years as on December 31, 2012. The upper age limit may be relaxed by 2 years as per rules. Federal Government has reserved 10% quota for women and 5% for minorities. If you possess above eligibility criteria, you can apply. Get application forms, syllabus and rules from FPSC Head Office, Regional Offices and Information Centres on production of original deposit slip of Rs.1500 in any branch of Government Treasury or State Bank of Pakistan or National Bank of Pakistan under the head of Account "C-02101-Organs of State Examination Fee (FPSC Receipt)". Application form can also be downloaded from official website of FPSC. Photocopy of forms is also acceptable. Duly filled application forms must reach before the closing date, 31 Dec 2012. For more information, see following advertisement published in leading daily newspapers.